I am a big fan of caramel apples, but I can’t bite directly into them and can only eat them with the assistance of a sharp knife. I think that takes away a bit of the fun of eating a caramel apple, so when I saw these grapes I figured there are probably tons of other people out there like me who would like to enjoy something caramel coated that didn’t require biting directly into it. And what’s better than a bite-sized treat like a grape? I opted to not go the sweet and salty route of the original recipe, coating the grapes with caramel and crushed cashews and instead I kept the entire bite sized treat sweet by dipping it in crushed graham crackers. 1. Poke toothpicks into each grape. 2. In a small bowl, combine caramel bits and heavy cream and microwave in 30 second intervals, stirring each time until melted and smooth. 3. 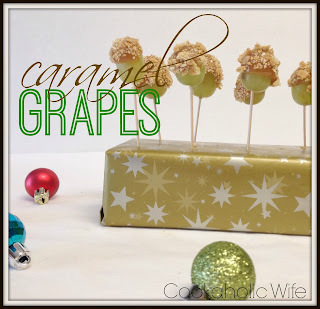 Quickly dip each grape into the caramel, swirling to coat the bottom, then dip into the crushed graham crackers, making sure to coat the caramel area. 4. Repeat with remaining grapes. 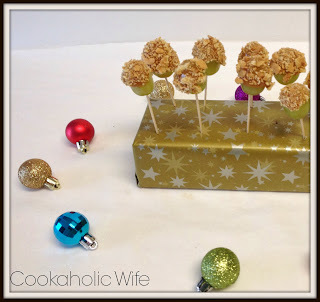 Bite sized treats are some of my favorite things to serve to guests who drop in during the holidays. With just a few minutes needed to make these, you could easily whip them together if you had any unexpected guests, or even as quick make-ahead appetizer for a holiday party or even your Christmas day or holiday celebration.